Established in 1956, Kampong Lorong Buangkok is the last surviving kampong on mainland Singapore. Located near Gerald Drive (off Yio Chu Kang Road), the kampong currently houses less than 30 families, Malays and Chinese mixed with harmony. The houses, connected by dirt roads, are mostly made of wood with zinc roofs. The roaming dogs, cats and chicken co-exist with one another in this peaceful village, where time seems to be frozen since 40 years ago. Children likes to play and fish at a big canal behind the village. The residents of Kampong Lorong Buangkok pay a small monthly token of not more than $30 to the landlord Madam Sng Mui Hong, who inherited the plot of land from her father decades ago. The little kampong received electricity and water supplies in 1963, two years before the independence of Singapore. There are unconfirmed news that the land where the kampong is situated will be used for development in the near future, which means the 40-plus year-old kampong will not escape the rapid urbanisation of Singapore. The most recent kampong in Singapore that was forced to cease to exist was at Khatib Bongsu. Used to be accessible through a muddy track off Yishun Avenue 6, the kampong‘s last two residents were being requested by the Ministry of Defence (Mindef) to move, because the nearby forested area has been marked as a restricted military training ground since the early nineties. 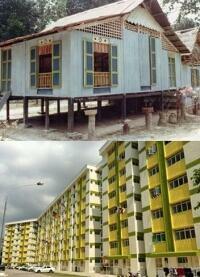 By 2007, the zinc-roofed houses at Khatib Bongsu were demolished. At the end of 2010, a jogging track which is linked to Sengkang Riverside Park was built behind the kampong, allowing joggers to enjoy the peaceful ambiance of that area. A few steps away from the kampong is Leong Yoke Keng Hardware Manufacturing Factory, probably as old as the kampong itself, with two gigantic warehouses with zinc-plated roofs. The region of Buangkok, situated not far from the kampong, is now filled with modern HDB flats of less than 5 years old, a stark contrast compared to the humble kampong. Let’s hope the unique “kampong spirit” will last forever! Charming. Is there another kampongs in the surrounding island? How about the kampong/fishing village at Seletar? We are destroying the past too fast. We are losing our past. It is very sad. The gov is systematically targetting what it deems sub-optimally productive land(read: all those old places) all over the country, and “re-purposing” them to supposedly benefit this land-scarce nation(read: line the national coffers). This is their idea of “nation building” alright, in every literal sense of the word…except they forgot to ask if this is how we want it. Oh wait, they did do the national dialog thing alright. But we all know it’s a foregone conclusion anyway. Everything’s been decided well in advance, the show-and-tell is just a polite formality. Leong Yoke Keng Hardware Manufacturing Factory has been there for aeons! Whenevery I jog or cycle on the park connector next to the kampong, I always see kampong houses. I once saw men walking out of the kampong into the park connector. I also live near the kampong at Sengkang. there a pair of stone lions situated at back gate of surya home along lor buangkok. to reach this part of lor buangkok, u have to go in via the hdb buangkok link and continue into lor buangkok after the roundabout and take the first right turn once u get into lor buangkok. drive up 30-50m on a badly pothole road and you will see a pair of majestic looking stone lions. not very big, about 1m by 1.5m, height less than 1m. i dunno the history of the lions, maybe you can find out from the ppl inside the home. So sad if this goes too. We are moving too fast. The kampong is still there,with new pavements. (: My aunty lives there. Everytime,during hari raya…the whole lots of our family including our cousins will visit them. So fun and enjoyable. I’m from a group of local Instagram interest group called InstaSG (our Instagram handle is @instaSG). We would like to organise an Instagram photowalk (a casual photo-taking session) around Kampong Lorong Buangkok. We organise this photowalk once a month, to different places. And our previous photo-walks include Gardens by the Bay, Thieves Market, Haji Lane, Little India, etc. And for our January 2014 photowalk, we would like to organise one to Kampong Buangkok, to capture the rustic charm of Singapore’s last kampong. We respect the privacy of the residents at Kampong Buangkok, and will only take photos of the building exteriors and surrounding compound (unless invited by the residents to go into their houses). Understand that your auntie lives there. Appreciate if you can advise whether it is ‘ok’ for a group of 20 to 30 people taking photos there, most probably on a Saturday morning or afternoon. SINGAPORE – Residents in Jalan Kayu can look forward to a multi-purpose sports facility in the first half of 2015, which will feature a skating zone and areas for yoga. Located in Buangkok Crescent, the 0.48ha facility will cost over $1.5 million to build, announced Dr Intan Azura Mokhtar, the adviser to Jalan Kayu Grassroots Organisations, at a media briefing yesterday. Dr Intan, who is a Member of Parliament for Ang Mo Kio GRC, was speaking to reporters ahead of a ministerial community visit on April 14 by Minister in the Prime Minister’s Office Grace Fu. The facility is expected to directly benefit residents living in the 29 Housing Board blocks nearby, and private residences in Gerald Drive. Some 22,000 residents live in the Jalan Kayu ward, which encompasses Serangoon North Avenue 4 and Ang Mo Kio Avenue 10. No mall is too far from your home! No place unreachable by the MRT! No corner untouched by the mighty aspalt! 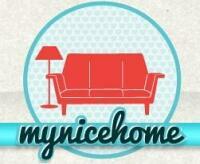 No HDB flat that isn’t spanking new! Those dusty old places? Don’t worry we’ll have them cleaned up in no time! Welcome to “Uniquely S’pore”! Agree with you 100% Melvin. I couldn’t have put it better myself. Ironically, the only thing unique about Singapore is that it is the only country in the world where nothing is unique. Hi, I found this is a very amazing controversial photo. I am doing a university thesis report about housing typology in singapore, may I have the courtesy to request this copy of photo from u ? Preserve this photo. It’s a perfect depiction of an ugly grey tidal wave that will drown Singapore’s soul. My family lived in Bangkok before moving to Hougang. I’ve photos to share if anyone is keen. I used to live in Jalan Tongkang Pechah which is very near to Jalan Buankok. Do you have old photos of the kampong and the present development? Thanks. Yes it is still there ! (: everyone is welcome to take some photos! Hi pple, for information the kampong now is ceasing. I wanted to go in but it was for closure and barred at the construction site and a lots of stray dogs are there. I wonder got any other ways for me to go in to take a look. Hi I was wondering if I could use your pictures to be published. could you kindly contact me at my provided e-mail? thank you. We’re a team of students doing research on Kampong Lorong Buangkok and we would love it if you can take part in our survey. We’re really hoping to conserve Kampong Lorong Buangkok because we strongly feel that it is a part of Singapore’s heritage and culture. Your views would mean a lot to us. Thank you! The old St Luke’s Church and Surya Home might be demolished. Need further researching. as of today, with the launch of new bto at Buangkok, the area might be cleared for high rise residential development. Hi. I heard the Kampong Glam will be demolished and redeveloped.. Is it true? If yes, does anyone know the rough date? Thanks. amazing, I wanna go there ASAP. I plan to go there is weekend (5 Sep 2015), may I know if the Kampong is still there ? Yes it is still there ! Do take a look around. Thanks PinkRanger . I’m happy to learn that the kampong is still there. Looking forward to this trip back memory lane. By the way , just a confirmation , I can take bus 854 direct from Bedok right ? Or is there any faster way? Thanks once again ! Thank you for your swift response and help. I sincerely appreciate the gracious gesture ! Is the village still there or has it been demolished? Can’t find any news on it and was really hoping to check it out when I go to Singapore in two weeks..
yes it is still there ! My grandma side aunties are still residing there. It’s one of the oldest kampung in singapore that is still standing till today. You can check it out ! But no fliming is allowed. Taking pictures is ok. Have fun exploring ! Farrah, I am visiting from the UK in Sept 2016, I am hoping to visit the Kampung and take some photographs, I used to live in Seletar Hills in the 1960’s, I wish to make a keepsake of how I remember Singapore from those days, do I need permission from anyone in the village to take Photo’s? I am disabled and cannot walk very far, would I be allowed to take a taxi into the village and then do my bits of photography? I would not intrude on anyone’s privacy, however if a resident would like to help me with the photography I would be very grateful. @ Matt Stoves , hi ! Hi! Is there any opening hours to this location? Cuz I’m thinking of having a photoshoot for my friend over there tomorrow! This place is open 365 & 24/7 everyday ! All are welcome to this place. Hi , appreciate if anyone can advise if this is still standing ? Would like to bring my famil for viewing before it is gone . Thank you ! Can the Singapore government ‘force’ the land owner to develop or would they simply rezone the land and let the higher taxes force the owners to sell.